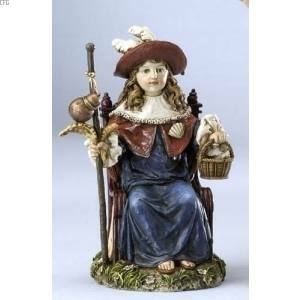 The Santo NiÃƒÂ±o de Atocha is a Roman Catholic depiction of the Infant Jesus and is popular in the Hispanic cultures of Spain, Mexico, and in the southwestern United States, especially New Mexico. During the 13th Century, Spain was under invasion by the Moors. The town of Atocha was lost by Spain to the Moors, and the Christian males were taken prisoners. The Moors placed strict prohibitions on the Spanish prisoners and restricted their rights to food. Eventually, only children under the age of 12 who were closely related to the captives could bring food to solely their relatives. The women of Atocha knew that most people in the jails would not survive under such conditions. Praying before the statue of Our Lady of Atocha, they pleaded for the Virgin to ask her Son for help. Reports began to spread among the people of Atocha that a child under the age of twelve had come to the prisons and given food and water to those in need. This young child, dressed in pilgrim's clothing, came to the prisons at night not only to bring the captives nourishment, but to talk and pray with them, giving them hope. When the women of Atocha heard of the miraculous Child, they returned to Our Lady of Atocha and thanked the Blessed Virgin for her intercession. Looking upon the image of the Madonna, they noticed that the shoes worn by the Infant Jesus held by Our Lady of Atocha were tattered and dusty. The shoes were replaced but became soiled once again. The people of Atocha saw this as a sign that the Infant Jesus went out every night to help those in need. The statue stands 6.25" tall and is made of a resin-stone mix.